Sorry for the delay with today's post. I'm sure you're all anxiously awaiting the announcement of the winners of the Autumn Blog Party. Unfortunately, everyone in my house has been sick for the past few days and it's slow going around here. So, without further delay, here are the winners. If you are a winner or prize donor expect an e-mail from me before the end of the day. Thanks again to everyone who helped make the party a success! The next party is the Christmas/Holiday edition and we already have a ton of great stuff lined up!! So stay tuned! Santa T-Shirt from Just For U Creations :: Heather M.
2 $35 Gift Certificates to Market Mommy :: Mena and Heather S.
What they do:: I am a stay at home mommy to my beautiful 8 month old little girl. She is such a joy to me! My husband and I recently moved so that he could attend seminary and when we moved, we decided to take the leap and have me stay at home. It was a hard decision and was definitely a leap of faith. To help supplement our income, I've started this bow business. 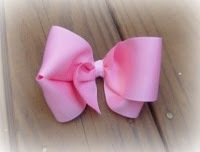 It started with simple single bows and I'm now working on more complicated custom bows and made to match bows. I've also recently added some clothing to the site. Right now we've got tie onesies for little baby boys and soon we'll be adding pillowcase dresses as well as a monogramming option. How she finds balance:: I do a lot of my work when my baby is asleep and my husband is in class or at work. Right now she's taking four hours worth of naps during the day and she goes to bed around 8 p.m. so I usually have plenty of time to get my orders done while still having time to be with my family when she's awake and he's at home. Her best advice:: Don't expect to take off right away. I've been going at this now for half a year and am just now starting to see repeat customers. Save Now:: When checking out, in your comments write "MarketMommy" and Christy will refund 10% of your purchase. Play and win:: Which is your favorite bow? What they do:: Transforming the customer experience and improving the connection between businesses and their customers. 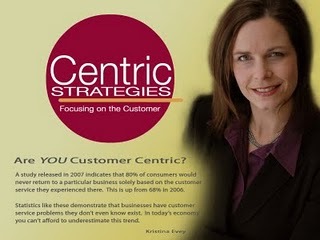 You can find more information by visiting www.KristinaEvey.com and www.CentricStrategies.com. How she finds balance:: I really try to stick to a schedule of working while the kids are in school and trying to keep the after school time open for them. Of course, reality doesn’t always work that way. So, when I am with my family, I try to stay disconnected from work. I try to give them my undivided attention for blocks of time. Her best advice:: Getting a sense of balance is important, but it is more important to recognize that the balance will always shift on a daily basis. Some days you will work more than you should, so spend more time with your family the next day. What they are giving away:: A CD of a product in her audio series - One on One with Lisa Ford – A Customer Centric Conversation by Kristina Evey. Play and win:: What is your favorite post in Kristina’s blog? Business Established:: March 2008, when Angela’s third child was due to be born. What they do:: Kids Kids Clothing is all about making products that are of high-qualtity, high-style and high-function. Our products are all Handmade in Canada and made in low production batches to keep products more creative and unique. New styles, designs and fabrics are always being added to the online store. Read more about Kewt Kids Clothing here. How she finds balance:: Balancing work and family life can always be a struggle. My husband works night shifts sometimes so after the kids have gone to bed I always try to devote those evenings to my work. Most days its a little bit of work, then a little bit of playing with kids, then a little more work, then a little cleaning, etc. The days are long and busy. Her best advice:: My biggest advice for other businesses is to always remember why you started your company. Sometimes I have to remind myself that part of my vision was to have more time to spend with my kids. If I find myself working too much I cut back. Save Now:: Kewt Kids Clothing is offering all Market Mommy readers a 15% discount on any purchase in their online store. Use promo code 'marketmommy' until November 1. What they are giving away:: Set of two Kewt Bandana Bibs in winners choice of a girl or boys set. 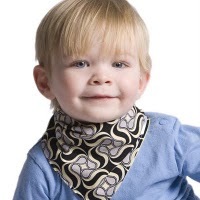 These are a bib designed especially for drool time and they sit close to the chin to catch dribbles and drools. Designed for 0-3 years. 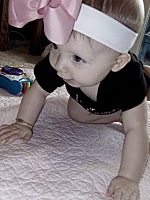 Play and win:: What is your favorite fabric for the Kewt Bandana Bibs? What they do:: Pendantlicious offers unique, affordable and handmade pendants and gifts from a home studio. How she finds balance:: I have only limited time to work on my craft, The majority of my work is done late in the evenings after I get off from my full time job. Her best advice:: To be successful, I believe you have to be happy in what you are doing. 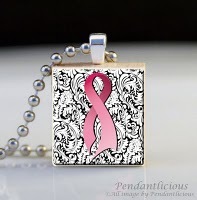 Play and win:: What is your favorite pendant offered by Pendantlicious?